Ikaria's abundant therapeutic radioenergized springs have been identified as amongst the best in the world in terms of healing qualities, radioenergy & temperature variance & water supply, and are particularly effective in treating a multitude of ailments and skin diseases because they can accommodate many different forms/strengths of therapy. Since the 1st century B.C. Therma, Ikaria has been a known center for hydrotherapy as evidenced by numerous references in historical texts and by the presence of archeological remains of ancient baths and facilities such as the Roman baths in ancient Therma. Today, Therma is still the principal region on Ikaria for organized hydrotherapy with numerous hotels/guesthouses, restaurants and three active bath/spa facilities: Cave, Apollon and Kratsas springs. Outdoor natural hydro- therapy is also popular on Ikaria. Along Ikaria's coastline there are several areas where radioenergic hot mineral springs flow into the sea from the shoreline where it is possible for one to bath & swim. These springs are perfect for those seeking relaxation and milder forms of unprescribed spa treatment. Lefkada near Agios Kirikos, Leumakia (near Therma) and Agia Kuriaki (near the airport) are some examples. 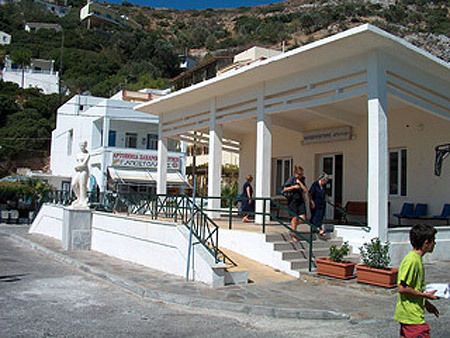 The essential elements in Ikaria's therapeutic radioenergic hot mineral springs are saline radium & radonium. The radio-energized mineral element saline radium and its gaseous form, radonium, have been geologically diluted in the springs. The therapeutic effects of Ikaria's radioenergic hot mineral baths are delivered to the body primarily through inhalation while bathing (90%) with the remaining ten percent is absorbed through the skin. Eighty percent of the active therapeutic elements are expired by the lungs after one hour and the remainder within twenty three hours. "HOT RADIOACTIVE MINERAL WATER SPRINGS OF IKARIA"
HISTORY OF CURATIVE SPA-THERAPY AND OF GREEK CURATIVE SPRINGS. The history of curative springs begins in ancient Greece. The first observer of these springs with curative properties was the historian Herodotus (484-410 B.C.) He described certain curative springs and, acting like a doctor,recommended spa therapy to be undertaken at particular seasons of the year for 21 days on end. Hippocrates od Cos (460-375 B.C. ),who is considered the founder of medical science and the father of hydrotherapy, paid great attention to the different natural waters which exist in marches and lakes, which are formed by rain and those which well out of rocks, namely mineral waters. These, he says, gush out and certain iron, copper,silver,gold,sulfur and other mineral elements. Apart from the different well-known references in the Holy Bible, in the Roman era and the Byzantine times many doctors studied hydrotherapy and curative spa-therapy. Such were Herophilos, Erasistratos, Asclepiades, Agathinos, Galenos,Oreibasios, Paul the Aeginetan and others. All these doctors accepted the curative influence of certain natural springs. One student in particular of Agathinos in the first century a.d. wrote about the therapeutic properties of curative springs and said that it was not possible to define precisely the manner in which each one of the springs individually develops its therapeutic properties, because that would require many years of observation and experimentation. This has held good until even the present day. FROM TECTONIC FISSURES IN THE REGION AND FROM ITS VOLCANICITY. Most mineral waters in Greece appear in coastal terrain along the shoreline. 5/6 of the springs are by the sea. The definitive morphological configuration presented nowadays by Greece is a consequence of the great subsidence which occurred in the whole geographical region. Within the tectonic fissures which also provoked the great subsidences were created the conditions for the formation of most curative mineral springs. These waters, which follow the orientation of tectonic fissures, because of the great depth from which they proceed are,as a rule, hyperthermal with temperatures above 38C. The current towards the surface is swift and for this reason they do not suffer great losses in their egress. Coastal fissures create mineral springs such as the springs of the Corinth region, the Western Peloponnese, Euboean, Maliakos, Eastern Macedonia, Western Thrace and the Eastern Aegean. Among coastal curative springs which issue from great depths are classified those of IKARIA, Lesbos and Samothrace. Moreover, the springs of New Apollonia at Langada are found in fissures which also form the lakes of Langada and Volvi. SALTWATER SPRINGS True saltwater springs issue from sea water and for this reason are richer in sodium chloride than all the other mineral springs. It is worth noting that, owing to their marine provenance, these waters are an inexhaustible source of bulk water. In their underground passage towards the surface they acquire constituents of rocks and derive their characteristics, such as a) the sulfurous saltwater springs of Methana, b) the ferrous springs of Thermi and c) the radioactive springs of Thermae and Agios Kirikos in IKARIA. SULPHURATED HYDROGEN SPRINGS They do not present any special enrichment in solid constituents. These springs include simply sodium hydrosulphide and plain hydrogen sulphide and are hyperthermal. SODIUM CHLORIDE SPRINGS Most sodium chloride springs are coastal and a large percentage of the volume of water which they pour out derives from seawater. Such are the springs of Agios Nicolas at Methana, Vouliagmeni in Attica, Cayafas, Cyllene in the Peloponnese, Cythnos and Loutraki. The calcium and hydrocarbonic acid ion content of the sodium hydrochloride hot mineral springs in relation to seawater is greater. ALKALINE SPRINGS These originate from rainwater. They appear inland far from the coasts. They can be enriched with plain carbonic acid and then they are also named acid springs. Likewise also even with hydrogen sulphide. The temperature of alkaline springs varies from hypothermal to hyperthermal. Hyperthermal can rise to 55C. RADIOACTIVE SPRINGS We call radioactive those springs which have been measured and are from 3,5 μ Mach and above, independently of their chemical composition and temperature. They are sub-divided into those of low, medium and high radioactive content. 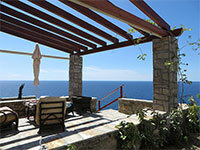 Most springs in IKARIA are hyperthermal radioactive saltwater springs of high and medium radioactive content. With low radioactive content are the springs of Lefkada and the Cave spring. In the region of hot, radioactive mineral springs of Agios Kirykos there are hypothermal mineral-bearing deposits whose creation is connected with the Grandiorite of the village of Xylosyrte. These deposits are lemonites within the marbles of the region of Agios Kirykos and quartz veins with iron and copper pyrites. The possibility is not ruled out that the presence of otunite minerals might exist within the compacted outgrowths of the Graniodiorite of the village of Xylosyrte in the region of the curative springs of Thermae in IKARIA. To the presence of these minerals is due also the radioactivity of the springs of IKARIA. The springs of Thermae and Agios Kirykos occupy a special place worldwide amongst the remaining curative springs owing to their important and beneficial action in the constitution of radon. To have effect, the thermal factor, the temperature of the water has to be 34°C or higher. 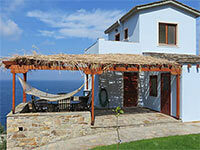 Most springs of IKARIA are above 38°C. In the links below appear the units of measurement of the different constituent elements in Ikarian Springs which are used for curative treatment. This form of arthritis differs from rheumatoid or any other form of arthritis. In this complaint uric acid in the blood count is high, the joints burn and show gradual arthritic and conjuctional alterations. The radon in the curative springs of IKARIA influences the increase in the metabolism of pourinon with solvent action on the uric acid, with the result that it is eliminated from the organism through dieresis, which is increased with spas with radioactive waters, as also even through the pores of increased perspiration. Many centers with curative spas function today throughout Europe, and specifically in Germany, France Switzerland, Italy, Greece, Russia, Hungary, and the Czech Republic. In the Mediterranean area, apart from Greece, Italy and Spain, curative tourism and health tourism has developed in Israel, Tunisia, Cyprus and Morocco. In Russia one in three Russians visit curative spa health centers. In Germany, which has 250-300 curative tourism health centers, over seven million individuals per year visit the centers. 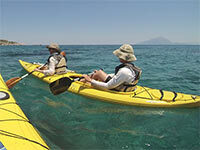 Italy, with 200 centers of curative tourism, has over six million visits per year to their centers. Hungary which is considered one of the most developed countries in this sector, has 120 centers of curative tourism with full furnishings and infrastructure. Over 22% of foreign visitors to the country have these centers as their destination. In Greece the therapeutic properties of certain springs like those of Ikaria, Aedipsos and others, were known from antiquity. Nowadays the greatest percentage of bathers in Greek spas are in August and September. From estimates it is evident that throughout the whole six-month period of May to October, when usually all the great spas in Greece are in service, an average of 40% of the bathings were carried out in the month of September. For the remainder there were 32% in the month of July, 5% in October, and scarcely 3% in June, while in the month of May the equivalent percentage is low. As far as age and the gender of the bathers is concerned, it is observed that usually they are individuals of manhood age, and women make up the greater percentage(approx.60-65%). The number of people each year who make use of curative springs as therapy for various complaints is equivalent to 1.5% of the population of Greece.